Mark Byerly (trumpet); Bob Jensen (trumpet); Keith Kaminski (saxophones); John Rutherford (trombone, tuba); Alberta Adams (vocal); Johnnie Bassett (vocal, guitar); Jimmy Bones (keys); Carl Cafagna (clarinet); Paul Carey (el. guitar); Clint Carpenter (drums); Chris Codish (vocal, keys); Thornetta Davis (vocal); Josef Deas (bass); Dan Eienheuser (bass); Johnny Evans (sax); Ja Franco (vocal); Larry Fratangelo (percussion); Wayne Gerard (guitar); Todd Glass (drums, percussion); Dale Grisa (keys); Tino Martin Gross (vocal); Erik Gustafson (el. guitar); Bill Higgins (drums); Mo Hollis (el. bass); Yorg Keriasiotis (vocal, keys); Michael King (vocal, el. guitar); Julien Labro (accordion); Liz Larin (vocal, guitar); Brett Lucas (el. bass); Mike Marshall (el. bass); Shawn McDonald (piano); Paradime (vocal); Barbara Payton (vocal); Evan Perri (guitar); Rick Roe (el. piano); Savallace (vocal); James Simonson (el. bass); Jimmy Smith (trumpet); Mike Smith (el. guitar); RJ Spangler (drums); Chris Sterr (el. guitar); Charles Stuart (drums); Robert Tye (el. guitar); Skeeto Valdez (drums); Brian Vander Ark (guitar, vocal); Shannon Wade (acc. bass); Nate Winn (drums). 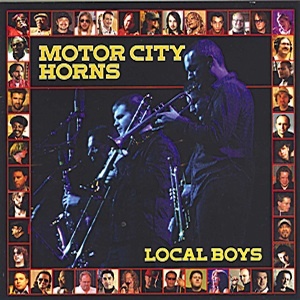 Showcasing their versatility as a horn section and the musical diversity of Detroit, this CD features 48 musicians (not on the same track!) in a variety of styles including Rock, Pop, R&B, Blues, Funk, Soul, and Jazz. Highlights include Brian Vander Ark from The Verve Pipe and appearances by background singers and sidemen from Bob Seger’s Silver Bullet Band and Kid Rock’s Twisted Brown Trucker.